Our ISO 13485:2003 registered operations in Alsip and Orland Park, Illinois include seven specialized machining areas and 70,000 square feet of manufacturing. 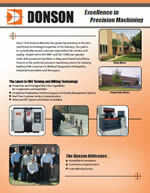 What sets us apart from other machining suppliers? The Bettinardi Family and all our employees remain faithful to our founding principles and are committed to delivering only the best in machined products and services for our valued customers. 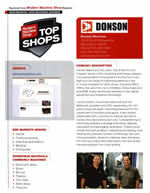 Donson engineering is a critical element of our relationship with key customers. We actively collaborate to improve part performance, manufacturability and cost. We assist customer design and manufacturing engineers with ideas and solutions to enhance the manufacturability of new and existing products. Our programmers and machinists have broad experience with a wide variety of part types and materials. Utilizing GibbsCAM software, all tool paths, moves and sequences are simulated and optimized before the first chip is cut. Utilizing standard modules and model extraction, time-consuming basic programming is minimized. We strive for optimized machining strategies and manufacturing complex parts in a single operation.